Bills quarterback Nathan Peterman was very extremely bad. Tyrod Taylor had a rough game last Sunday. Going against an excellent Saints team, the Bills’ normally solid quarterback passed for 56 yards with no touchdowns and one interception. It was the worst game of his career, but rather than let him bounce back against the Los Angeles Chargers, Buffalo coach Sean McDermott made a befuddling and awful move, deciding to start rookie quarterback Nathan Peterman in Taylor’s place on Sunday. Taylor is not a bad quarterback. He was a huge part of the Bills’ 5-4 start, which put them in the thick of the playoff hunt. Peterman, meanwhile, can proudly say that he led the Bills back from a 47-3 deficit to a 47-10 loss against the Saints after Taylor was benched. That’s the extent of Peterman’s NFL career. To sit Taylor after a single bad game was, in a word, stupid. Wait, let’s give it two words: insanely stupid. When McDermott announced the switch on Wednesday, he said he was “impressed” by Peterman’s “maturity,” calling the move a “calculated risk.” It now joins history’s other notable calculated risks, including invading Russia in the wintertime and giving Chevy Chase a talk show. 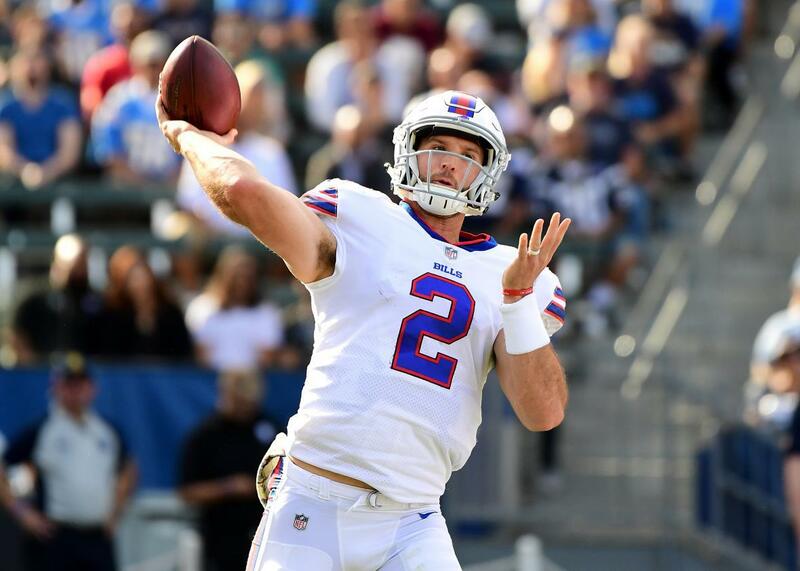 In the first half against the Chargers, Peterman threw for 66 yards, 0 touchdowns, and 5 interceptions in leading the Bills into the locker room down 37-7. He tied the Rams’ Keith Null for most interceptions thrown by a player in his first start, a record set in 2009. I would advise Peterman not to check the trajectory of Null’s career from that point forward. We saw some bad quarterback play on Sunday, but this was the Mona Lisa of incompetence under center. Heck, it was the entire Louvre. There is really no explanation as to why McDermott kept sending Peterman back out there. Perhaps two billionaires had made a wager that they could turn a street urchin into a starting NFL quarterback, and McDermott had to at least wait until halftime to see the bet out? Throughout that nightmare first half, the Twitter account of Mike Rodak, ESPN’s Bills reporter, became a Peterman tracking service, alerting disbelieving readers each time the quarterback ran onto the field, and informing us all about just how just loudly the traveling Buffalo fans booed him when he did. Peterman coming back out. There are boos in the stadium. Nathan Peterman is ready to come back out with the offense on this possession. And we have some more scattered boos at the StubHub Center as Nathan Peterman returns to the field. Fans are chanting “We want Tyrod” at the StubHub Center. Five interceptions is a lot. For reference, over the first nine games of the season, Taylor had thrown only three. That’s pretty good! I bet the Bills wished they had a quarterback like that. In conclusion, McDermott managed to aggrieve his starting quarterback, destroy the confidence of the rookie backup, and perhaps throw away his team’s playoff chances, all in one fell swoop. Taylor replaced Peterman for the Bills’ first offensive series of the second half, but he was joined on the field by hundreds of horses who had escaped before McDermott could shut the barn doors at the StubHub Center. Peterman, meanwhile, attempted to return to his home planet.